Vancity Buzz has collected a number of screenshots that depict Vancouver as part of a futuristic megacity that’s amalgamated with Seattle. 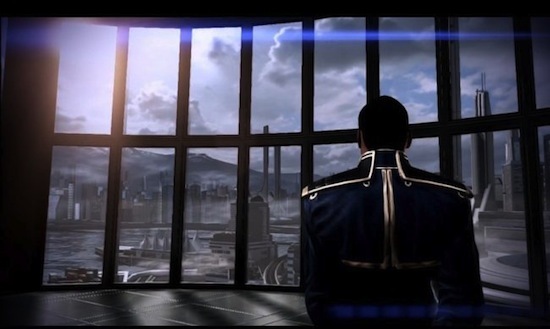 In this screenshot you can clearly see the Vancouver Convention center as Commander Shepard awaits his trial at the hands of the Human Systems Alliance. In the new trailer, we can see Burrard inlet being savaged by Reaver invaders. I love how you can still make out the suburbs around the bottom of the North Shore mountains. Too many futuristic cities are designed with 100% urbanization in mind, and that is completely at odds with the culture here in Lotus Land. And with all these aliens bringing the property values down, we can hope for a future when our great grandchildren finally, finally can afford 900 square feet in the West End. The rest of the screenshots can be found here and here.